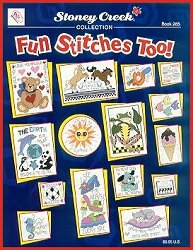 Navigate: StoreFront / Stoney Creek Cross Stitch Charts & Patterns / Stoney Creek Books / Book 285 Fun Stitches Too! Wow! 27 fun, quick and easy cross stitch designs for beginners! Horses (pair of kicking horses with saying, "Life without horses, I don't think so!"